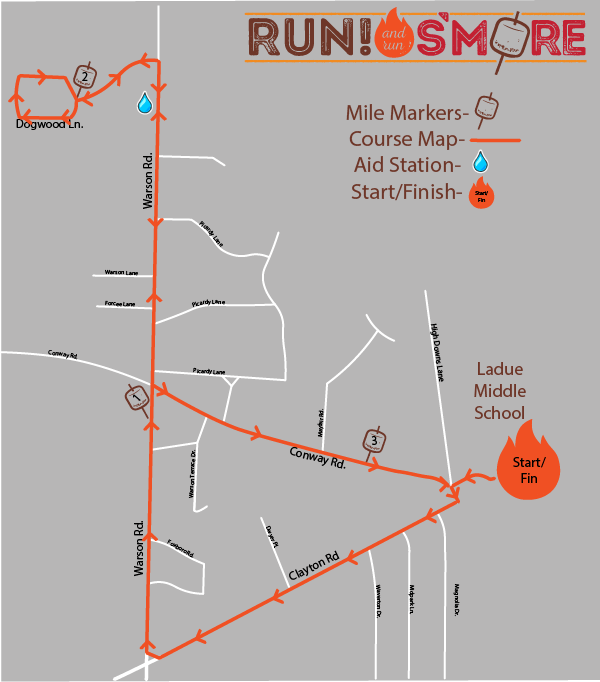 Registration for our event is through Chronotrack on www.runandrunsmore.com ONLY. Your registration receipt will be from Chronotrack, no other event site receipts will be accepted. PRICE INCREASE ON FEBRUARY 16, 2019 (TO $40), REGISTER TODAY!! Dogs are allowed. They must be on a leash. It’s a relatively fast course with a few hills along the way. Our signature feature is 'Jackson's Hill', fastest female and male up the hill wins a special prize. Will there be water on the course? Yes. We will have one water stop half way through the race. Are there age group awards? Yes. The top 3 finishers of every age group and gender will receive a medal. Where and when is packet pick up? You are allowed to pick other people’s packets. We ask you bring a photocopy of their photo id. Does this race have chip timing? Yes. Big River Race Management is charge of our race timing. They will have results on their website immediately following the race. How far is a 5k? Is the 1 mile fun run timed? The 1 mile fun run is not timed. What time does Run and Run S’more start? Packet pick up opens at 7:30 a.m. The 5k starts at 9:00 am.